The Research Team of Professor Koji Tojo Published their Research Result in "Royal Society Open Science"
The Research Team of Professor Koji Tojo of Institute of Mountain Science, Department of Atmospheric Environment & Aquatic Ecosystem, published their research achievement in "Royal Society Open Science" which was Open Science Journal published by British Royal Society. The research team established a method of environmental DNA analysis and succeeded in perceiving the abundance of endangered species aquatic heteropteran "Nepa hoffmanni" simply by drawing water. Since the method was also applicable to small aquatic heteropteran living at low density, it is expected to be applied to monitoring various endangered species or exotic species inhabiting water. The habitats of Nepa hoffmanni is rapidly decreasing or deteriorating, and it is designated as an endangered species in Hyogo prefecture and Tokai region. Moreover, it is designated as a protected species in Kuwana city, Mie prefecture. As its body length is around 23 mm and the hand-capturing survey is difficult, it remains an issue to spend a great deal of time and cost to confirm the habitats. Since DNA fragments (environmental DNA) derived from feces or epidermis of aquatic organisms are floating in the water environment such as wetlands, the research team verified the effectiveness of environmental DNA analytical method by conducting a field work using "real-time PCR (polymerase chain reaction) method" which can amplify and quantify DNA fragments of Nepa hoffmanni species-specifically, judging the abundance of Nepa hoffmanni, carrying out the hand-capturing survey in the field in parallel. The research team surveyed Nepa hoffmanni in Hyogo prefecture and Aichi prefecture. 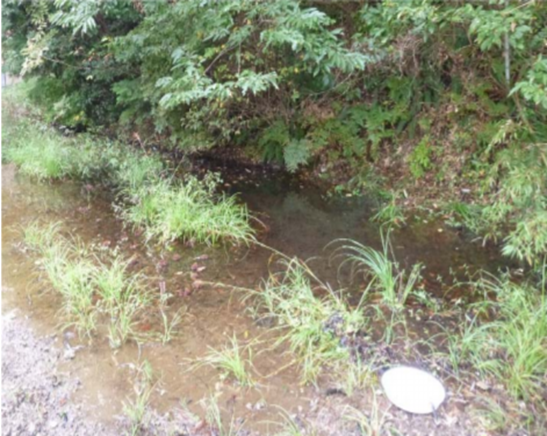 In 2014 and 2016, 1 liter of water was sampled at each of 14 wetlands and small streams, and analyzed the abundance of Nepa hoffmanni's DNA derived from feces, epidermis or body mucosa floating in water by real-time PCR method. At the same time, we investigated the inhabitation of Nepa hoffmanni in regular hand-capturing survey. In all 5 places where Nepa hoffmanni was captured, specific DNA of Nepa hoffmanni was detected from 1 liter of water, and inhabitation was confirmed from environmental DNA. In addition, we were able to confirm the inhabitation through environmental DNA at 4 places that were not found in the hand-capturing survey. It will take several hours in catch survey, but sampling will be completed in a few minutes, so it is to investigate in less time than before.